Governor Adams Oshiomhole has been spotted on stage with singer Timaya at a victory party. 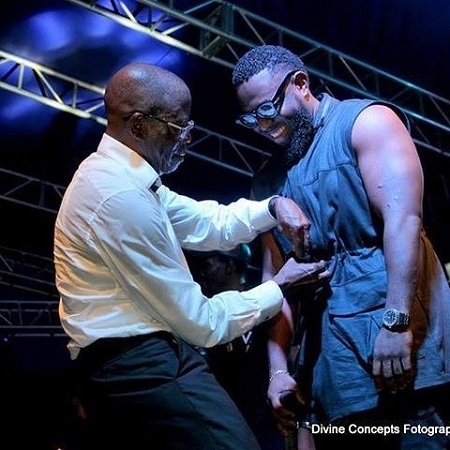 This is the moment the governor of Edo State, Adams Oshiomhole was caught on camera on stage with Timaya. He was spotted on stage with the singer at the victory party organized to celebrate APC’s Godwin Obaseki at Edo gubernatorial polls. Timaya shared the photo on his Instagram page explaining that the governor was actually trying to dress him up properly right there before everyone. 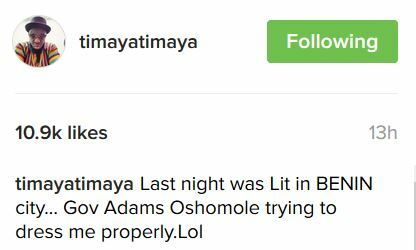 Obviously Oshiomhole felt, although lightedly, that the pop star was not properly dressed.